10 oil and gas areas are included. 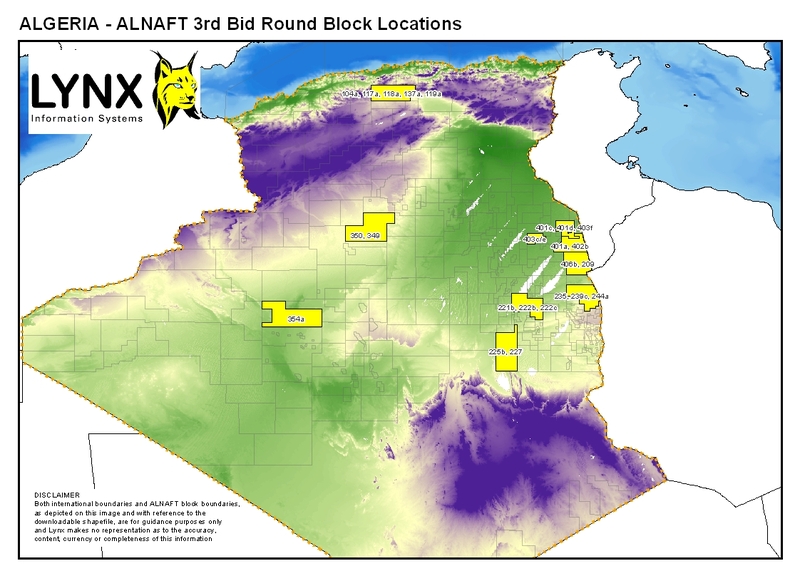 Lynx will be offering existing non-exclusive data, together with services for processing the new data to be released by ALNAFT. Contact us for details. Data rooms of detailed information on each project will be open from 3rd October until 30th November 2010, with final submissions by 10th January 2011. Download the block boundaries for open blocks as an ESRI shapefile – please enter your details before clicking on the link. See Downloads – Browser Compatibility. Please contact Lynx for details of our existing seismic and well log data, our data-room services and Algeria GIS data. This entry was posted in GIS-Downloads, Industry News, Licensing Rounds and tagged Algeria. Bookmark the permalink.